I only watch movies that either seem extremely interesting to me, or that friends think that I should see. Tineke van Brederode is such a friend, and last week she took care that I saw Déjà vu, a movie from 2006, made by Tony Scott and starring Denzel Washington. It is a time travel story and a very interesting one. I will not tell you anything, because it will spoil the effect if you are yet to see Déjà vu. Lucky you! Time travel is high on my list of fascinations. It is unclear to me what time travel is, because I don’t understand what Time is. I don’t think Time is something that can be travelled through. If time travel is possible, I think it should be called a journey IN time. As far as I understand it, the past and the future, and all the alternative pasts and futures, are already created. But for some mysterious reasons we only experience one specific route through all the possible situations. But that is not something that I know for sure, it is just the best idea I heard so far. 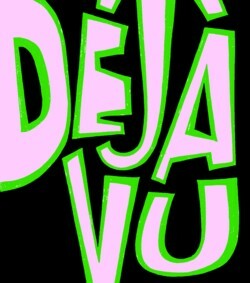 Déjà vu raises interesting questions, as: where or when did the first half of the movie happen when seen from the standpoint of a person in the second half of the movie? And what is the relation between the mind and Time? The movie ends with a beatiful song by Macy Gray, in which she mentions the words time machine. I wish there were more songs about time machines!